NESTA and the University of Cambridge have published their latest report into the alternative finance industry in the UK and it provides a detailed investigation into the state of the market in 2015. The new study, made public last week (17th February 2016), updates the findings from earlier reports on the sector published in 2013 and 2014. A large number of UK-based platforms across all types of alternative finance contributed to the research, providing a detailed picture of the market and its continued rapid growth. Some of the key figures in the study are below, but you can download the full report here. The study shows that the alternative finance market grew to £3.2 billion in 2015, up from £1.74 billion in 2014 – an increase of 83.9% year on year. All models of alternative finance reported growth in 2015, with donation-based crowdfunding becoming the fastest growing model. An impressive 1.09 million people invested, donated, or lent via online alternative finance platforms last year, with 257,721 individuals, projects, not-for-profits and businesses raising finance. London and the South East remain the most active regions in the market. The P2P Business Lending model, which LendingCrowd operates, again saw significant growth in 2015 with a total of £1.49 billion lent to businesses (including real estate). This is in comparison to £749 million in 2014, a growth of 99%. Lending volumes excluding real estate totalled £881 million, lent to around 10,000 SMEs. This represents approximately 13.9% of new bank loans to small businesses in the UK, compared with British Bank Association data for 2014. 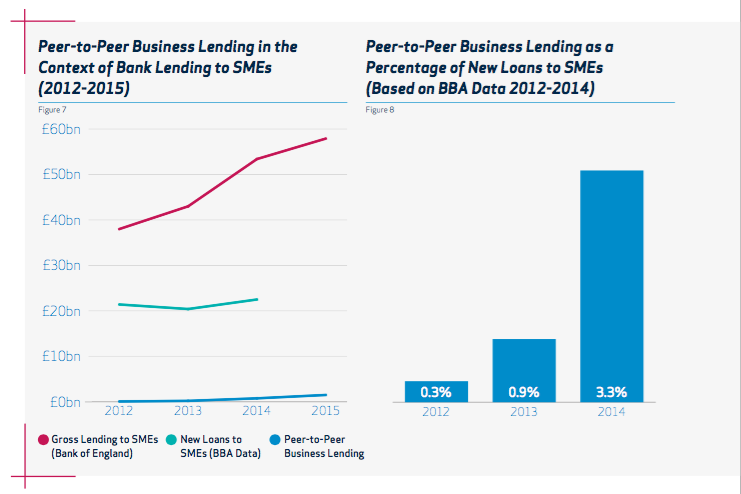 The average size of P2P business loans in 2015 was £76,280 and there was an average of 347 investors in a loan. 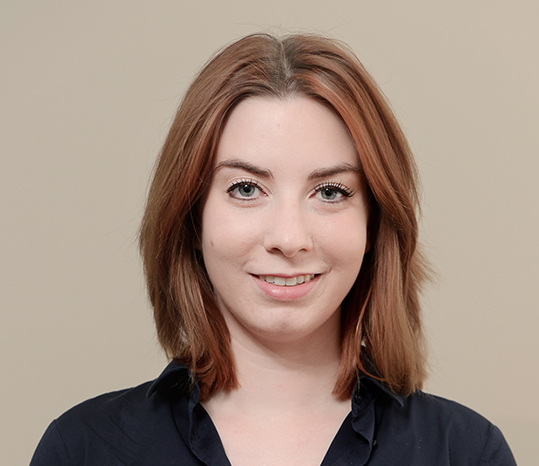 The introduction of the Innovative Finance ISA, which will allow the inclusion of P2P investments in the tax-free ISA wrapper, is expected to have a significant impact. 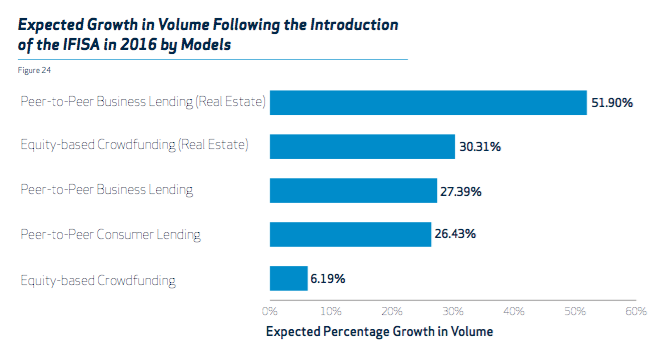 P2P business lending platforms expect on average a 27.4% increase in volume following the launch of the IFISA on 6th April 2016. 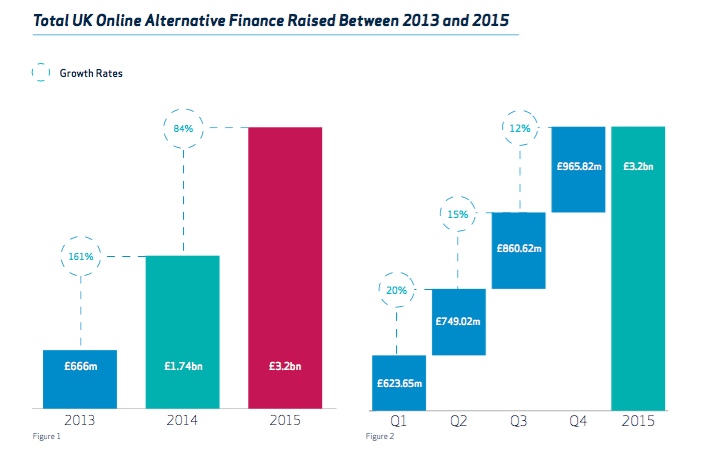 Overall the report shows that 2015 was a period of continued rapid growth for the alternative finance industry. The growth in both fundraising and the number of funders indicates that the sector is becoming increasingly well-known and is now providing a real alternative to traditional sources of funding. This ‘mainstreaming’ of alternative finance looks set to continue with the introduction of the Innovative Finance ISA, which many platforms expect will lead to a significant volume increase. 2016 seems set to be another exciting year for the alternative finance sector, with some big changes and new developments to look forward to!